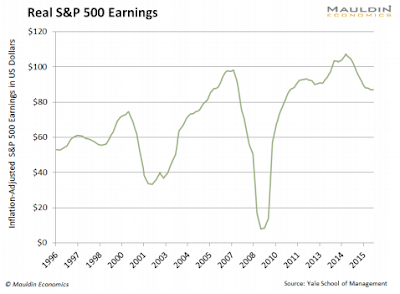 John Mauldin: " The S&P data does in fact show that earnings-per-share growth is increasing. That is good, right? Do we not want earnings to grow? Of course we do – but that’s not what is happening. What is happening is that companies are using the ultra-low interest rates the Federal Reserve has set to borrow money to do stock buybacks, which give us the illusion of growing earnings without actually increasing them – and creating a lot more debt on company balance sheets. How have earnings actually done in real (inflation-adjusted) terms? That is a different story. The above is data from Robert Shiller, who tracked earnings back to 1871. He then inflation-adjusted using 1983 as a starting point. This chart, which starts in 1966, shows that earnings in real terms have fallen back below their 2006 peak."